Once the winter is gone, the white that covers the “Green Country” reveals and uncovered the forests, grasslands and hundreds of roads and trails for those who wish to get lost in them. Or perhaps to find themselves. The de-icing and the rain have given way not only to muddy roads, but to path where hardly you could find a person and waterfalls on its brightest moments. Perhaps the little influx of people has made possible to find deers, otters, foxes and a great number of golden eagles on our way to the falls. 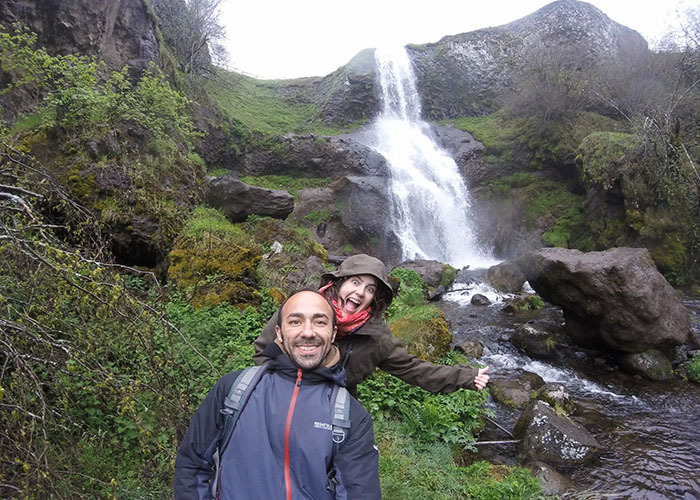 This department of the French region of Auvergne has thousands of corners to spend the night with the camper van, which has made it easier for us to enjoy “the waterfalls of the Cantal”. We begin the route in Murat, spending the first night on a hill next to the cemetery of Bredons church, with nice views over the village and not a noise to disturb our peace. 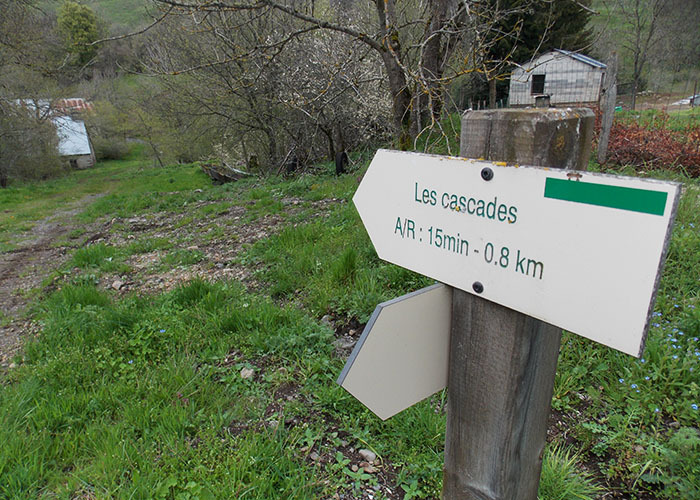 · From this point we head for “Les Cascades”, 3 of the 10 waterfalls we still have to discover; Prés Long, Vergnes and Prapsou . The almost 3 hours of circular route that lead us to them begin just after the village of Albipierre. 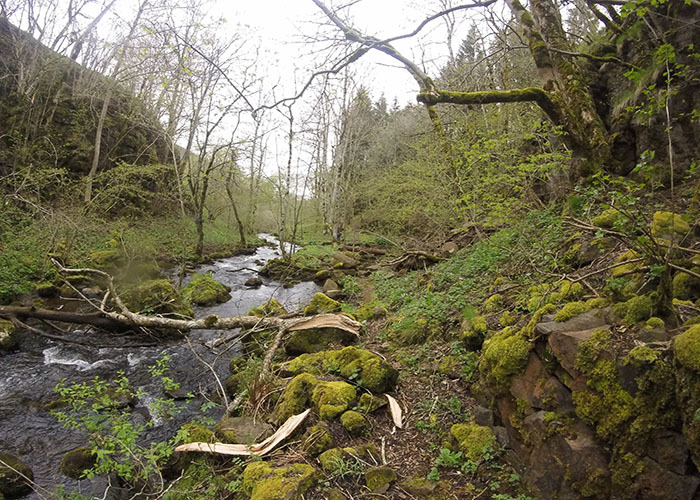 · After spending the night at the top of a road with views over Albipierre, just at the beginning of the path that take us along Les Cascades, we left toward the Moulin de Chambeuil Waterfall, perhaps one of the most beautiful. The walk is uphill but it is also a very short one. A path through the forest that takes you to the feet of several falls. No more than 40 minutes that well deserved the effort. It begins in the village of Cambeuil. You can spend the night in the free parking, very quiet and under the trees. · The next one we visit is the Roucole Waterfalland Pas Cere. You can park just a few meters from the cascade, in a rest area. But what is really stunning is to continue down the path towards the Gorges of Pas Cere, a path along the river bank between steep rocky walls of more than 30 meters high. Following this path you can continue until the next village, Vic Sur Cére. It took us 2,5 hours roundtrip. · After the beautiful and lonely trek in the Gorges du Pas Cere, we drive to Vic Sur Cère where we will find Trou de la Conche waterfall. The walk departs from a path at the back of the church. In just 15 minutes we are at the waterfall. A gap on the rock spit the water that runs down from the Iraliot brook. You can sleep in a free of charge caravans parking, close to a supermarket and with good access on foot to the village. 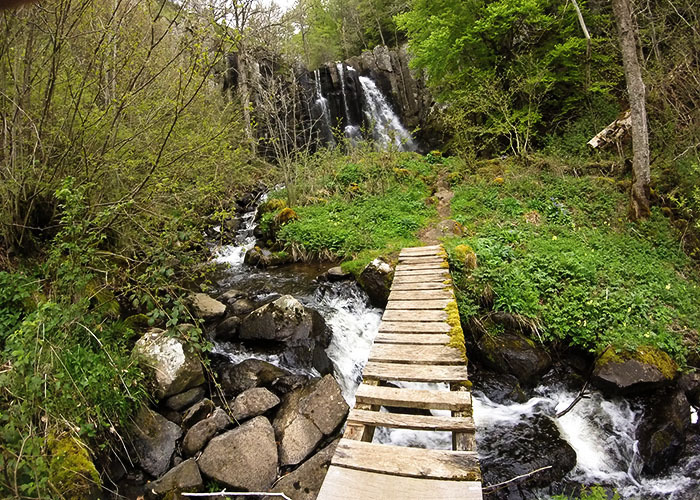 · Since all the waterfalls are very close to each other and the nice landscape makes the distances even shorter, we decide to set off to Failltoux Waterfall. It is a 15 minutes’ walk between cows and bulls that at some point make you think if you should detour a little. The 41 meters falls is one of the highest in The Cantal. We spent the night at the gates of the path with beautiful views over the valley. To get there we must go to the cemetery of Thiézac, and once here, continue towards Lasmolineries. 1 km after the village we will see the signal. · The Veyrines Waterfall lies in an archaeological site where the waterfall and its surroundings are covered in snow and ice in the winter months. It is located between “Les Prades” and “le “buron des estives”. Very easy to spot and just a few meters from a car park next to the road. · On the road towards Terrise Waterfall we see tens of Golden Eagles that undertake the flight next to the car. 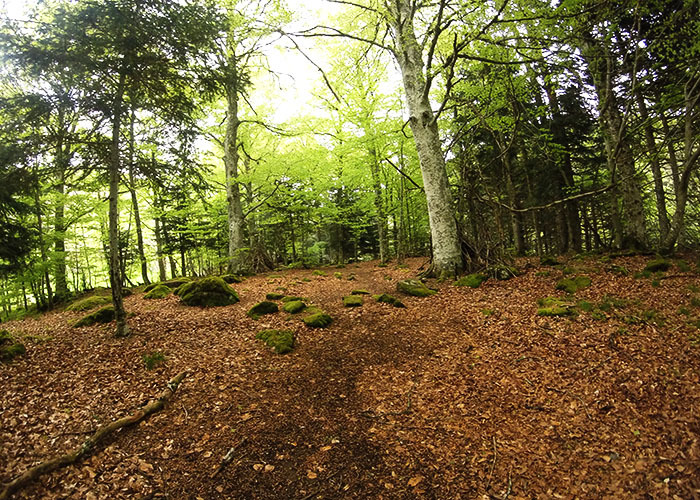 Once again the walk is short and nice, among trees and a narrow path that lead you to the Terrise fall. The Terrise is a 20 meters high fall formed by rocks with straight forms. To get here we have to drive through Pradiers towards La Ferme de Cezallie and soon after we will see a red signal that indicates the path to follow. 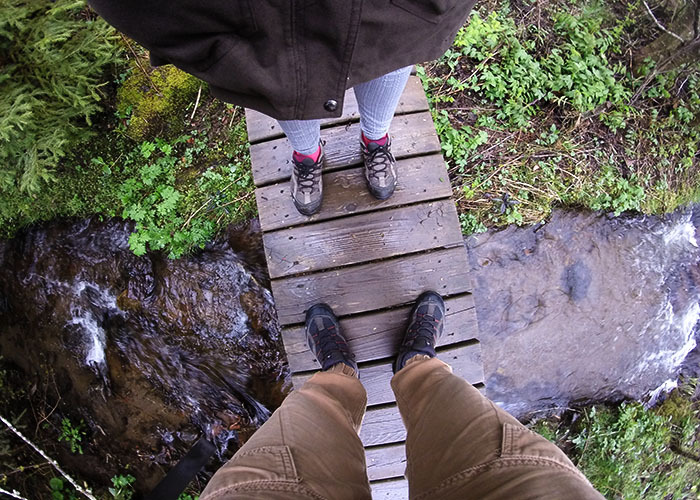 · We see the last 3 waterfalls in a day, the trails start from tiny villages and the access is very simple and well marked. In only 15 minutes walking we come right in front of Montval Waterfall. It is a beautiful stroll along the banks of the river. 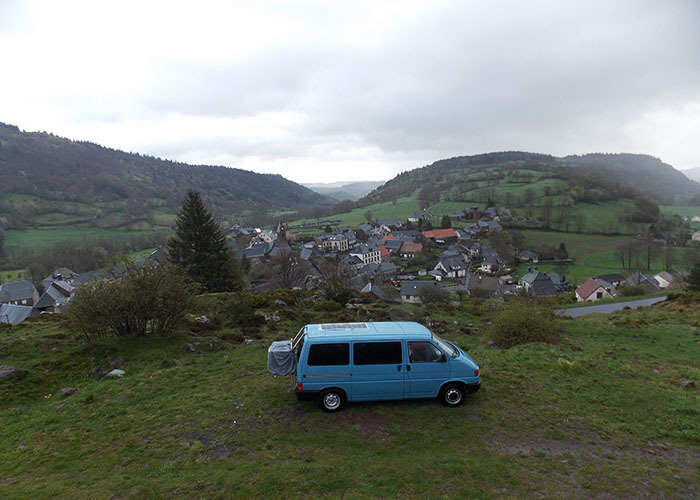 The van can be parked in Courbières, next to the main road from where the path starts. · The last walk among waterfalls is similar to the rest, quiet, nice, surrounded by nature, animals and with the rain following us everywhere. To get to the Saillant Waterfall we must drive to the highest point of Le Saillant village, and soon we will see a signal and the water falling from a stone bridge. There is a little fence for catlle that we have to jump and 10 minutes later we will be at the Saillant waterfall. 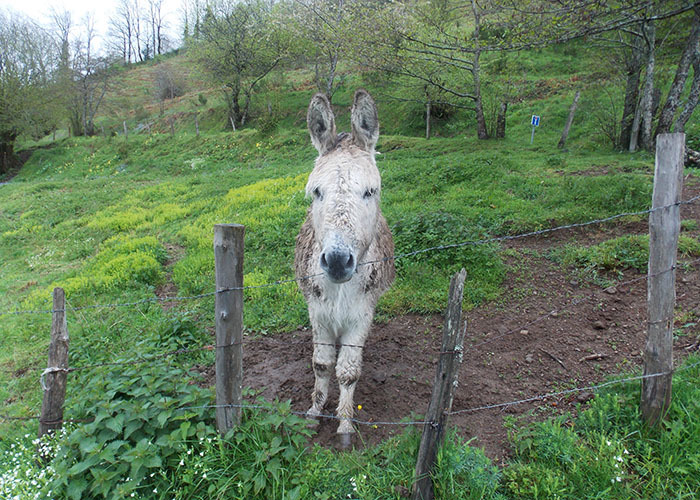 Have you been overlandig France? Would you like to do it? Do you want to live travelling in a van around the world?